Do we really need to defend god’s house? We can say that god will provide, but we still pay the electric bill at church so the building stays comfortable. We say that god will provide, but we fix the roof to keep the rain out. The United States was formed, in part, after religious persecution drove millions of people out of Europe. God provided the United States. Now, the broader culture is extending its resources back into the church. Every day, several million of us go legally armed in public. We don’t notice because these armed civilians carry concealed. Millions more go armed occasionally, but not every day. Millions decided to carry in church after the mass murder in Texas. All but two states allow it. This is new in degree, but not by type. Concealed carry in church has been happening for years, so insurance companies already allow it. Insurance companies also insure church security teams, just as they insure armed staff in schools. This is less of a change than it might appear. The self-defense culture just got a little bigger and more active. It changed from an eight hour a day by five days a week attitude to a 24 x 7 orientation. The murder in Sutherland, Texas changed the way church staff think of their job and the way parishioners think of their church. The changes affect large and small congregations, and they are complementary rather than antagonistic. Protecting your church from a crazy man is only the tip of the iceberg. Church was never a safe place, and religious institutions have become less safe with time. Robbery and assault on church property are far more common than mass murder. One of the original legal cases that brought legal concealed carry to Illinois was the case of Mary Shepard. Mary is the treasurer of her church. She and another woman were nearly beaten to death during a robbery at church late at night. Now, Mary Shepard can carry in Illinois, and at her church. One size does not fit everyone, and one solution doesn’t fit every church. 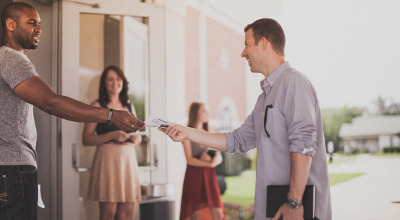 Large churches want a security team to keep their pastor and his family safe. These teams also protect guest speakers and visiting celebrities. The security coverage extends from the parking lot into every building. These security teams include both paid and volunteer members. That is one end of the security spectrum. In smaller churches, parishioners still want to keep their family safe. They will carry when and where they can. The great news is that parishioners and volunteers are involved in every church activity. Sure, they are at the main service on Sunday, but they are also part of the men’s group that meets at night during the week. They are part of the woman’s group that meets on weekdays and the food kitchen that provides free meals every morning. Since they were unofficial and concealed, you never knew these church activities were protected. Like society at large, these volunteers are everywhere, from the church parking lot to the church nursery. That is true today more than ever. Churches security can be simple or complex. In either case, churches don’t have to re-invent “church security.” It is already in place at tens of thousands of religious institutions across the United States. These churches are willing and eager to share. The solutions are easier than you might imagine. In fact, part of the solution is taking place whether it is recognized by church staff or not. We’ve always protected ourselves and our families. Now, we protect our businesses and our schools. After the murder in Texas, Armed America embraces our churches, our synagogues, and our mosques.